Last Thursday, Race Relations, a student DIME (Diversity, Inclusivity, Multiculturalism, Equity) group, hosted a Community Life panel discussion on race. 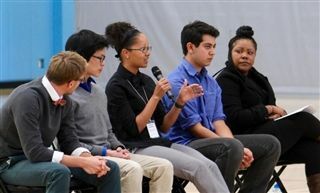 The Pacific Ridge students, faculty, and staff who comprised the panel spoke candidly about the role race has played in their interactions with authority figures, experiences on campus, and daily lives. Panelists encouraged the student body to remain open minded and emphatic to the struggles of minorities, and to be willing to engage in uncomfortable, but necessary, conversations about race, equality, and privilege.